"s/t" & "Live at Beerland 6.25.16"
Bright, distorted, twangy guitars. Beatles harmonies with a pinch of sass, but still bad boy territory. High energy, rolls a plenty drum beats. Well placed, heavy bass end. Sparkly when needed, harsh when required. Well placed double guitar/bass solo on the opener "Pinnacle". If these guys head bang, sweat and stay vitamin B/Bee Pollen/Moringa smoothie healthy, plenty of shut eye before shows and such, leave it all on the basement floor, ... and rip out a steady, scrappy set like this cassette they're well worth the door price and will leave of trail of devoted fans and a good chance of being written about in "Our Band Could Be Your Life Part 2: Bee Pollen Smoothie Hangover". Yeah man, you can just tell a difference in the guitar solos here ... the guy is really selling them. I believe him. Great bluesy rock guitar hooks in "I Feel Alien" that curbstomp dings dongs like Ted Nugget and Donald Trump. Mental visions of buildings exploding and skeletons on motorcycles. "Swamp Thing" is a bit more garage and straight forward. The singer does have a growl somewhere between Danzig and Cobain that's really polished and down. I dig it. 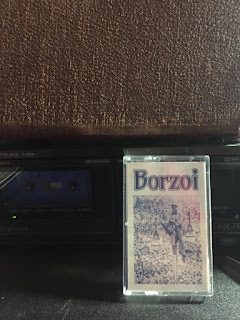 "Worry Wart" is a tight post-albani punk nugget that sounds recorded live and exemplifies Borzoi's ability to operate like a unit, a feat difficult to perform since it demands a certain level of harmonic obedience between band members. It's like a well oiled machine with measures of feedback ... oh wait it sounds this way because this is a ... LIVE RECORDING! Side two is a live recording ... as raw as an Op Ivy bootleg. The live set exemplifies the surfiness of the guitars. This is a band that is probably rocking live. Yeah ... this tape is worth checking out. Fans of Agent Orange, Pixies, Santa Cruz 80ties skate videos, gnarly guitar solos will probably dig this.